Hot Chip emerge to the stage at Gorilla Manchester, which is unsurprisingly packed. The audience feel lucky to be seeing this well-known London-born indie-electronic band in such a small venue; the excitement and anticipation is manifesting in the crowd. The five band members appear on stage in front of a pastel back drop. Their clothes, too, match this ethereal, cloud themed set and even front-man Alexis Taylor has dyed his hair appropriately in pinks, blues and yellows. The visuals create a dreamy feel which persists throughout the show as Hot Chip began to play their eclectic range of songs. The band played favourites such as ‘Flutes’, ‘One Life Stand’ and ‘Boy from School’ as well as two new songs ‘Hungry Child’ and ‘Melody of Love’. It impressed me that even classics such as ‘Ready for the Floor’ sounded fresh after all these years – Hot Chip’s sound remains infectiously captivating which the changing colourful lights and dreamscape visuals only contributed to this. Hot Chip have been described as indie-electronic, synth-pop, alternative dance and house to name just a few – fitting for such an experimental and diverse band. The instruments on stage were also varied, and there were a lot of them: we counted at least eight keyboards. 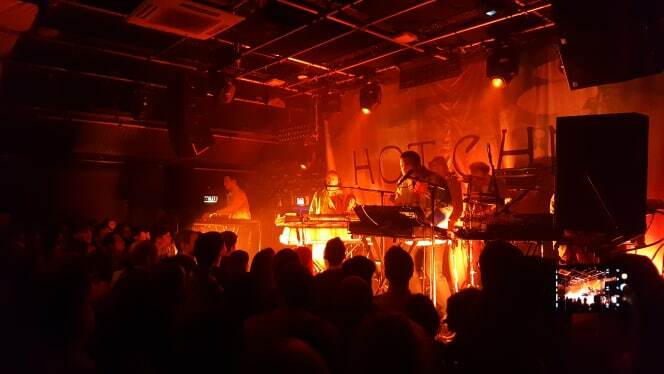 There were moments at the gig when Hot Chip’s influences were particularly prominent: a robotic voice which sounded just like Kraftwerk and new wave elements akin to Talking Heads. After some research of Hot Chip’s influences, both of the above band names were mentioned as well as perhaps less easily recognisable traces such as Prince and the late Beatles. Garage and funk are also cited as influences. Hot Chip exists as an amalgamation of a broad range of artists and styles resulting in a unique sound which continues to inspire fans. Hot Chip temporarily took a break from playing their own music to perform a cover of ‘Sabotage’ by Beastie Boys. It was well-received by the audience who were slightly older than I had expected. Although there were plenty of people around the age of twenty, the majority appeared to be in thirty to fifty age bracket. This reminded me how long Hot Chip has been going, formed officially in 2000. Last night’s performance by no means suggested the band would be stopping producing music any time soon, their energy and enjoyment were clear. In fact, today it has been released that Hot Chip will put out a new album called A Bath Full Of Ecstasy which will be available on 21st June. Upcoming performances include Blue Dot Festival on 19th July where Hot Chip will play amongst the likes of Kraftwerk and New Order. That really isn’t one to miss. Overall, it was a great night. Hot Chip kept everyone entertained through their pulsating rhythms and eye-catching light displays. I am sure for many there it was a nostalgic experience hearing the favourite songs of their youth. At 19, the nostalgic element was not as strong for me; however, I still thoroughly enjoyed Hot Chip.